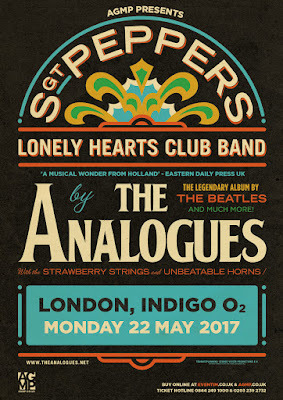 The Analogues are an amazing group of musicians who pick up where The Beatles left off after their last show on August 29th 1966 and became a studio band for the rest of their career together. 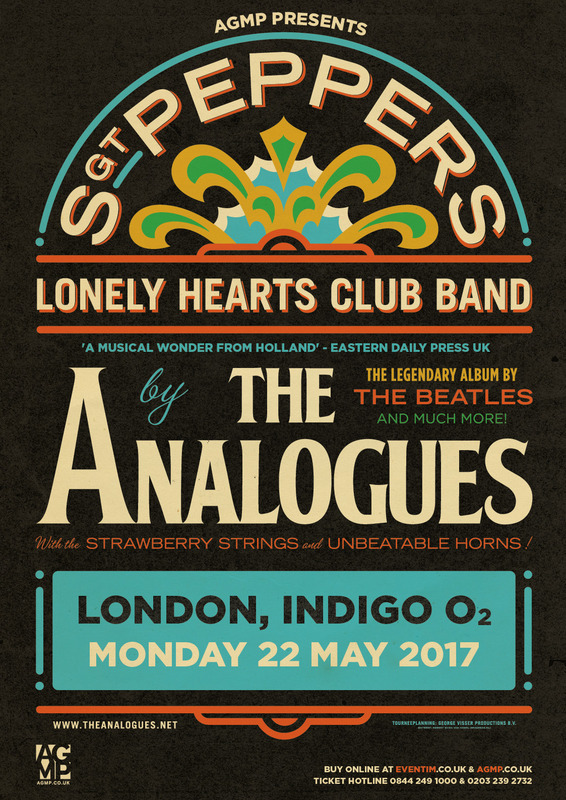 On May 22nd The Analogues will perform Sergeant Pepper's Lonely Hearts Club Band live and in its entirety at The Indigo O2, fifty years after this most famous Beatles album was originally released. This will be their first show in London after 47 sell out dates in The Netherlands and Belgium to ecstatic audiences. The band have a passionate commitment to authentically reproducing live, music only previously heard in the confines of Studio 2 at Abbey Road Studios. Playing a unique collection of vintage instruments from the period with full string and horn sections means the audience will hear a note perfect reproduction of this most iconic album for the first time. Geoff Emerick, who was the Sound Engineer on all the studio albums at Abbey Road from 1966 - 1970 and worked closely with The Beatles as they created Sergeant Pepper is a huge fan of The Analogues and commented on hearing them for the first time, "Listening to the Analogues, I have never heard anything come so close to the original records." The Analogues are not a cover band or Beatles tribute with wigs and costumes but an exceptionally talented group of Beatles' loving musicians reverentially recreating a note perfect performance of The Beatles studio albums never heard live...until now. As Geoff Emerick said on hearing them perform, "they get these records absolutely perfect. If you close your eyes you would really be listening to the original recordings sounding the way they are supposed to sound for the first time. Even The Beatles couldn't reproduce Sergeant Pepper live". Click to to hear them, learn more about them and BUY tickets to the show before it sells out! Unique Beatles Double Anniversary to be celebrated at Hare & Hounds on 4 June. 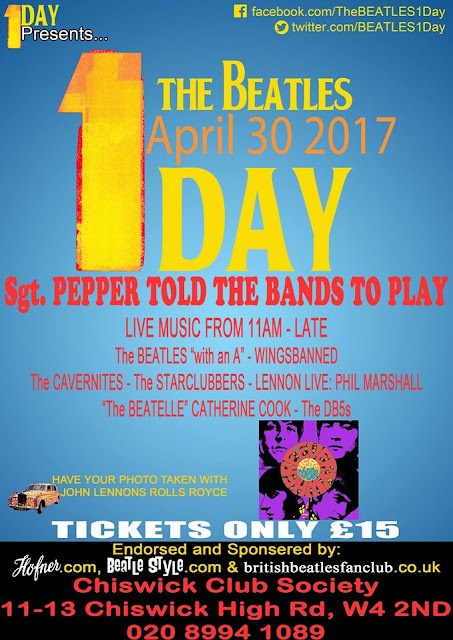 50 advance discount tickets at only £12.50 have just been released for a unique show by John Lennon's sister Julia Baird's favourite Beatles tribute band. It will be 50 years ago in June 1963 that The Beatles released what is regarded by many to be the greatest album of all time - Sgt Pepper's Lonely Hearts Club Band. Now King's Heath Walk Of Fame are delighted to present The Mersey Beatles in a special intimate gig at the award winning Hare & Hounds on Sunday 4 June in a unique double celebration of the 50th Anniversary of the album's release and the 54th Anniversary of The Beatles third and final appearance in 1963 at the now sadly burnt down Ritz Ballroom next door to the Hare & Hounds on York Road, King's Heath, Birmingham. Often described as 'the Best Beatles tribute band', The Mersey Beatles were all born and grew up in Liverpool. They were the resident band at the legendary Cavern Club for over 10 years and now regularly tour throughout Europe and the U.S.A. Earlier this year they returned to perform their Sgt Pepper show at Liverpool's prestigious Epstein Theatre. John Lennon's sister Julia Baird comparing them to other Beatles tribute bands said 'The Mersey Beatles are the most authentic I've heard ... and I've heard them all'. Joe Flannery, Brian Epstein's assistant, said 'When I saw them in The Cavern they perfectly recreated the atmosphere that the original Beatles produced. It was like listening to The Beatles again'. A review of a previous show said 'The quality of the music was superb with each song reproduced in the original key with spot-on harmonies and perfect guitar solos that had the audience marvelling at the sheer quality of the talent on view'. Standard tickets will then cost £15. The Hare and Hounds is a standing and dancing only venue. "The very first tune I ever learned to play was 'That'll Be The Day'. My mother Julia taught it to me on the banjo, sitting there with endless patience until I managed to work out all the chords." From the writer of the stage play adaptation of Helen Forrester's 'Twopence to Cross the Mersey' comes a brand-new comedy about the disappearance of Lennon's first musical instrument. 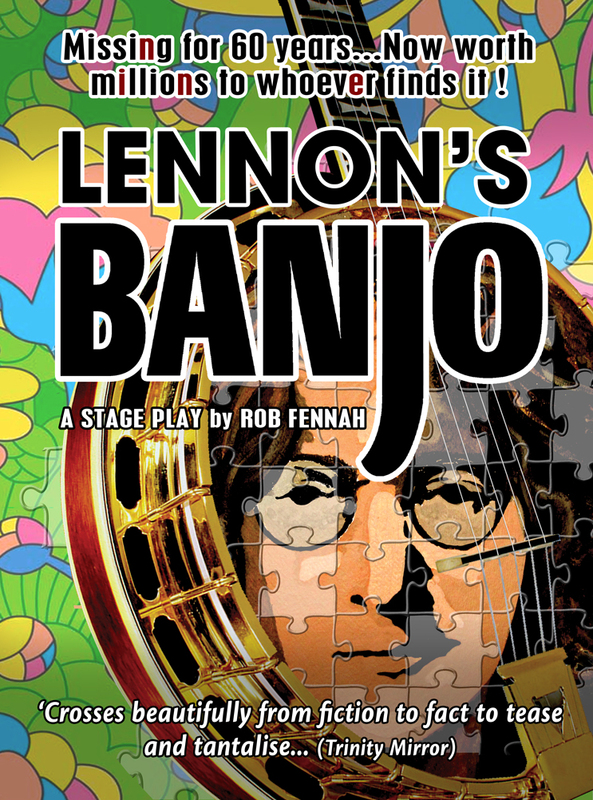 The play is based on the 2012 novel 'Julia's Banjo' by Rob Fennah and Helen A Jones and will mark the 60th anniversary of Julia Lennon's death and the disappearance of the banjo she taught her son to play. 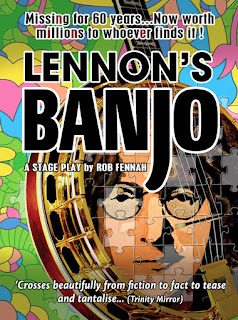 Produced by Pulse Records Ltd in association with Bill Elms, Lennon's Banjo will open at Liverpool's Epstein Theatre on Tuesday 24th April 2018 for a two-week run until Saturday 5th May. Full cast and creative team to be announced soon. Set in present day Liverpool: When Beatles tour guide Barry Seddon finds a letter written by John Lennon he unearths a clue to the solving the greatest mystery in pop history - the whereabouts of Lennon's first musical instrument which has been missing for 60 years. But Barry's loose tongue alerts Texan dealer, Travis Lawson, to the priceless relic. In an attempt to get his hands on the letter and the clues within he persuades his beautiful wife, Cheryl, to befriend the hapless tour guide and win his affections. The race for the holy grail of pop memorabilia is on! So where do the facts end and the fiction begin? Everything will be revealed in this fast paced, comic caper, multi-media play. Stage writer and Co-producer Rob Fennah said: "The banjo has been described as the holy grail of pop memorabilia - and for good reason. Without it, there wouldn't have been a Beatles and, without them, everything we know today would be different. Given that a piano John once owned went under the hammer at Sotheby's in 2000 for 1.5 million pounds, it's reasonable to assume the banjo, the first instrument the greatest rock and roll legend ever learned to play, would be worth millions more. As a Beatles fan, I knew all about Julia and how she taught John to play banjo but, what I didn't know, until a dealer at a Beatles convention told me, was that the banjo, the catalyst that changed the world, went missing shortly after Julia Lennon died in 1958. It's the most fascinating tale in pop history and I honestly believe it's out there somewhere just waiting to be found." Co-producer Bill Elms added: "The story is so true to life that the audience will leave the theatre secretly wanting to solve the mystery for themselves. It's The Beatles meet the Da Vinci Code, an hilarious treasure hunt romp through Beatledom." Missing for 60 years. The holy grail of pop is now worth millions to whoever finds it! Proud Galleries is pleased to present ‘The Beatles Unseen: Photographs by David Magnus’ a moving documentation of the legendary band’s phenomenal ascent by photographer David Magnus, who bore witness to some of their greatest moments. This exhibition, featuring many previously unseen photographs, is a fascinating and deeply candid insight into The Beatles during an historic occasion taken at the world famous EMI Studio 1 in Abbey Road. BBFC treasurer, Ernie Sutton, attended the opening night and reports that this exhibit is well worth a visit so don't miss it. Find out more on the gallery website and learn more about how David Magnus first met the Beatles. Famed for its iconic cover image and classic songs, the album 'Abbey Road' was never performed in concert by The Beatles themselves... On Saturday 22nd April, 2017, a seven-piece band of professional musicians will be recreating the sound and spirit of this incredible record, live on stage at Parr St. Studio 2 in Liverpool! Hailed by many as a 'Masterpiece' and 'One of the Greatest Albums of All Time', 1969's 'Abbey Road' was the final album The Beatles recorded together before going their separate ways in the spring of 1970. Encompassing a broad range of styles, as eclectic as the four individuals who composed and performed it, Abbey Road effortlessly blends genres such as blues rock and vaudeville pop, alongside progressive rock, elegant ballads, and of course the epic suite at the album's close, serving as one of Rock's greatest swan songs. Join us for another walk down Abbey Road, lovingly recreated and performed in Liverpool, the birthplace of The Beatles. With a full evening of music, including support, and a Beatles-themed after party, this unique event is not to be missed.